We have of course seen technology massively disrupt and redefine these and so many other categories through increasing accessibility and / or reducing friction and making things easier for people. In addition to business objectives, many established MNC’s also recognise the need to embrace digital communications to better reflect the way people are consuming media. This typically results in either arbitrary targets being plucked out of the air, or paying large consultancy fees to be told what their competitors are doing (who are operating in the same ‘categories’) then use that as a benchmark. As such, many brands have something along the lines of ‘spend 25% on digital’ as another objective. Around a year ago I came across the work of Sandra Vandermerwe whilst studying my MA in Digital Media Management at Hyper Island. Despite having been written 20 years ago, her work which advocates a business’ focus should not be on trade defined categories, but market spaces defined by consumer behaviour, resonates today more than ever. It’s a painfully simple concept. Instead of Lego framing their innovation pipeline, trade strategy and marketing plan around being the number one constructed toy company, they defined a broader market space of ‘family edutainment.’ So rather than being disrupted by angry birds on one hand and educational apps on the other, they were able to converge toys, computer games, education and even movies as part of this broader market space resulting in phenomenal growth. Mr Porter isn’t an online retailer, it’s a destination for men’s style. 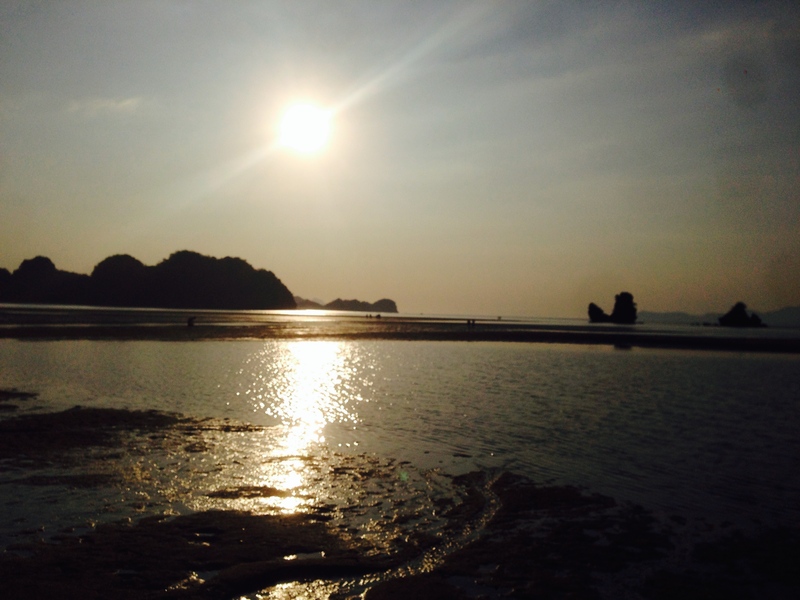 Through great editorial and personalised service it’s created a much broader market place than just selling clothes. Don’t be surprised if in the future Mr Porter start also making the travel destinations in their editorial and photoshoots shoppable as well. So how does this help an FMCG marketer? By applying Vandermerwe’s concept of the market space, there is the potential to redefine your brand strategy, unlock new revenue streams and through ‘customer lock on’ have a marketing strategy that is built around the behaviour of your consumer. This in turn typically leads to a significant redeployment of budgets into digital media and technology. 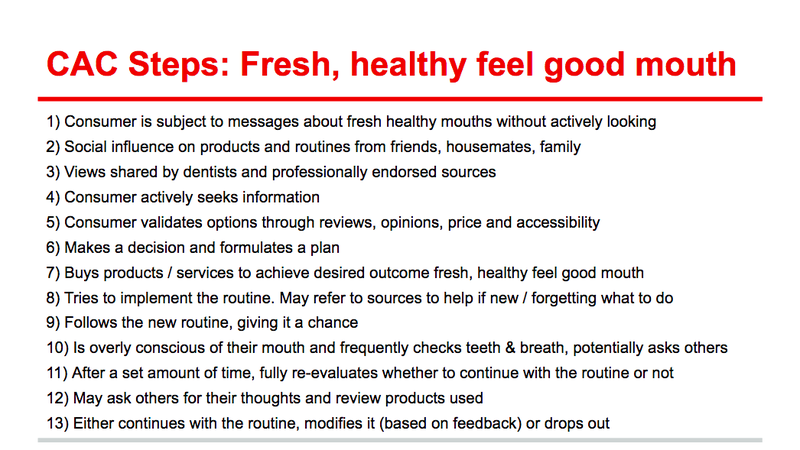 Here is a brief summary of an example I’ve written up for a fictitious oral care brand. Now this may or may not be the right way to go, I’m not particularly close to the category. However what I want to demonstrate is what happens when we start building a Customer Activity Cycle around the desired outcome above. 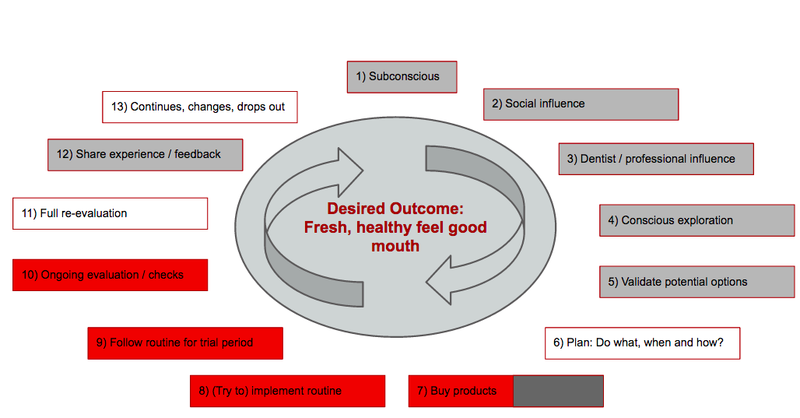 Below are the pre, during and post stages identified in the consumer journey of achieving the desired outcome of a fresh, healthy feel good mouth. If we then map that out, we can see the role technology can play to converge some of these steps and take waste out. Steps 7 – 10 could be addressed through a platform that facilitates product purchase, routine compliance and results monitoring (from teeth colour to breath monitoring), ensure customer lock on for the company that does so. The grey boxes above show where digital communications can be used to provide utility and influence, from native advertising on professional websites to the syndicating of product reviews from other consumers. It also highlights the finite capacity of traditional broadcast media to be able to influence at the majority of stages outlined in the CAC. These collectively lead to a natural migration to digital media and technology to achieve business goals that are based on revenue growth and that are not restricted by pre-defined categories (that could be ripe for disruption).